When it’s time to kick back and relax by the ocean, your Seaside Ukulele is always ready with inspiring style and sound. 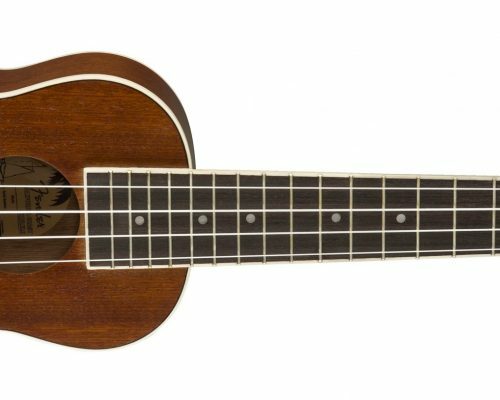 Compact, comfortable and easily portable, this soprano uke is ideal for beginning players or anyone looking to add its light, joyful sound to their music. The slim “C”-shaped neck profile is comfortable and easy to move around on, while the no-tie bridge makes changing strings a breeze. Crafted from mahogany for warm, bell-like tone, the Seaside’s open-pore finish gives it an organic look. The top, back and fingerboard bindings add a touch of elegance, while the traditional 2×2 headstock is sure to appeal to uke aficionados of all kinds. Get away from the daily grind and let relaxing waves of sound take you somewhere inspiring – your Seaside Ukulele will be ready.